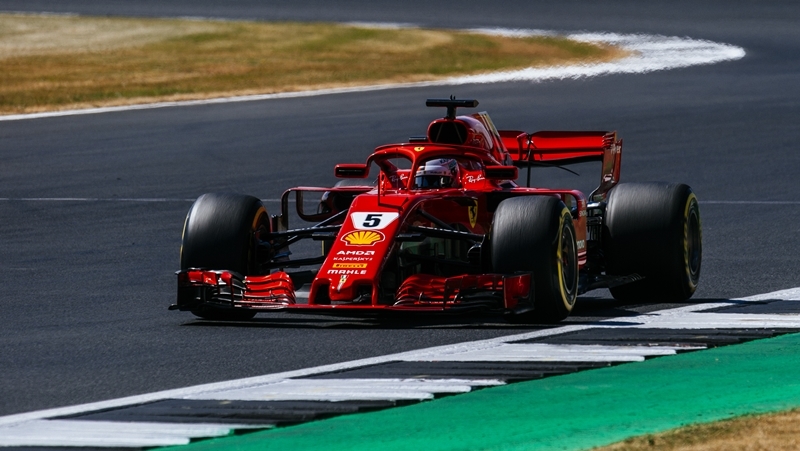 FORMULA ONE: Sebastian Vettel broke British hearts yesterday (July 8) with a memorable victory at Silverstone after dispatching pole-sitter and crowd favourite Lewis Hamilton, but the vanquished Briton implied foul play had had a hand in deciding the British Grand Prix. Hamilton had logged a career-best lap in qualifying on Saturday (July 7) to take pole position, but a poor start lost him places to Vettel and Valtteri Bottas on the run to the first turn. By turn three Kimi Raikkonen was lining up the Briton to take advantage of his tardy getaway, but the Finn locked his front-left wheel and smacked into the side of the Mercedes, knocking it off the road and sending Hamilton tumbling down the order. “All I’ll say is there’s now two races the Ferraris have taken out one of the Mercedes,” he said, referring to Vettel’s crash with Bottas at the French Grand Prix. Raikkonen, for his part, was apologetic for causing the accident. “My bad,” he said. “But that’s how it goes sometimes. While the stewards were deliberating on the crash, for which Raikkonen was handed a 10-second time penalty, Hamilton was scything through the field, and he required only 11 laps to rejoin the front-running cars in sixth place in time for the first pit stop window. The top six, now on the durable medium-compound tyre, settled into a rhythm, with Vettel leading Bottas ahead of Max Verstappen, Daniel Ricciardo and Raikkonen, but a lap-32 safety car turned the grand prix on its head after Sauber’s Marcus Ericsson had left his drag reduction system open as he entered turn one, crashing heavily into the barriers. Vettel, Verstappen and Raikkonen all stopped for fresh soft-compound rubber, but Bottas and Hamilton had no new soft tyres left, so the team left both drivers out to pick up track position, promoting the former into the lead and the latter to third place, sandwiching Vettel in second. The race therefore became a battle between the Mercedes keeping their old tyres alive and the aggressive Ferrari and Red Bull Racing cars chasing them down to seize the podium. The race had 15 laps left to run when it resumed on lap 37, but Romain Grosjean and Carlos Sainz crashed into each other one lap later, triggering a second safety car that absorbed another precious three laps for the Mercedes drivers. When finally the race got back underway at the end of lap 41 Vettel and Bottas sparred, with the German applying extreme pressure with his fresh tyres but the Finn getting his elbows out in defence. It took five laps for the Ferrari to overwhelm the Mercedes, diving down the inside at turn six and seizing the place. Bottas hadn’t defend strongly, and thereafter he sunk down the order, his 31-lap-old tyres flagging. Hamilton sliced past him on the next lap to steal second and Raikkonen relieved him of third on lap 49. Vettel crossed the line an ecstatic man, recording Ferrari’s first win at the Mercedes-dominated circuit since 2011 and Vettel’s first victory in England since 2009. “Obviously the safety car spiced it up, but it was a nice battle,” he said. “Valtteri was pushing like crazy. It was not so easy to find a way through. “Very, very happy. Thanks to the team supporting me. Bottas ended the race fourth after fending off Daniel Ricciardo’s advances, the Australian having been promoted from sixth when his Red Bull Racing teammate, Max Verstappen retired after spinning off the road late in the race. Nico Hulkenberg finished sixth despite qualifying 11th in his Renault, while Force India’s Esteban Ocon was happy to come home seventh for six points. Fernando Alonso scored four points for McLaren after a torrid week for the struggling British team, which lost its racing director, Eric Boullier, in a swingeing restructure just days before the race. Kevin Magnussen scored just two points for Haas after starting the race from seventh place, and Pierre Gasly finished 10th for Toro Rosso.